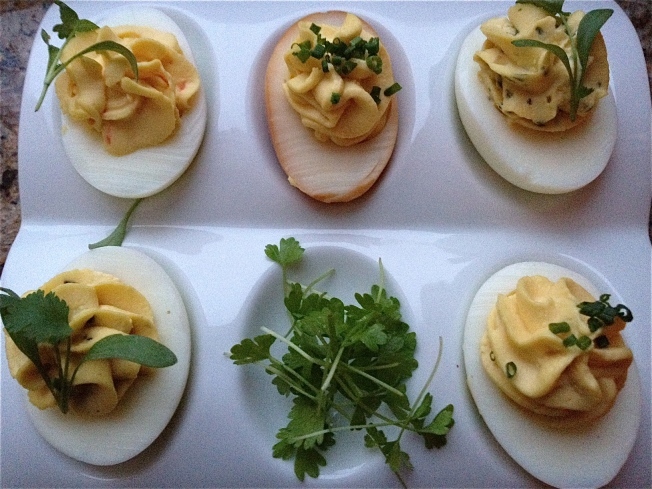 Deviled Petaluma eggs come in a variety of luxe flavors at Seasons Bar and Lounge. When Oliver Lee, the manager of Seasons Bar and Lounge at Four Seasons Hotel San Francisco, extended an invitation to experience a newly relaunched menu, Good Taste took it as an excuse to happily slow life down by a couple of years in exchange for a taste of the duck fat burger. The heartstopper has been a Sunday night staple of the menu for a few years and remains so that people won't yell at Lee if it disappears. Turns out that the food and beverage program has changed more than just the addition of new items and solidification of classics, though. Gifted with more freedom to individualize the lounge even more, Lee has replaced the formal feel of the old menu with a more approachable and playful one, and the new emphasis is on local purveyors. Chef Mark Richardson has added more shareable plates of comfort food with elevated twists, as in a quintet of silky deviled Petaluma eggs in different luxe flavors like truffle and Béarnaise. There's a lot of impressive Bay Area bred beer, wine, and "hooch" here, as the menu calls its homegrown spirits section. Lee has a section for cocktails made with all local ingredients, but one is the very definition of hyperlocal. The Ocean Beach, he says, is his favorite cocktail that he's ever created, a blend of Vya sweet vermouth and St. George single malt with pomegranate simple syrup and tart kumquats from Lee's own Redwood City backyard. It was difficult to nail the balance of ingredients — a few shifts in the wrong direction made it undrinkable to his palate — but once he perfected it, a new level of understanding about making drinks arrived. It will probably not stay on the menu for too long, as he's been fleecing his tree of all its fruit. This is about as close as most of us will get to lounging in Lee's backyard as he utilizes the bounty of produce around him to inspire new ideas, but what a novel way to glimpse the local spirit living inside such a big international hotel chain.